Shell Village, as I am reliably informed it is known as by the locals, is situated in Ban Don Bay, Surat Thani. 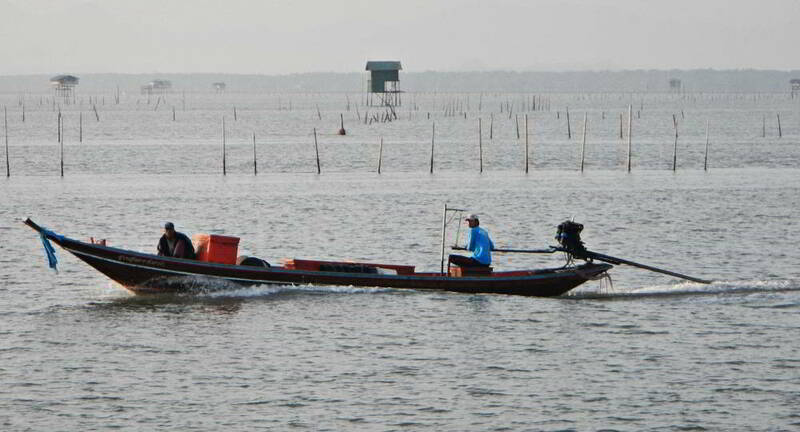 This coastal area of Surat Thani in southern Thailand was extensively covered by mangrove forests which have now made way for commercial farming of shellfish. What is outstanding about Ban Don Bay is the sight of such a vast area populated with what appear to be houses on stilts and the miles of fence protruding from the sea. It really does have the appearance of a village at sea. In reality I suspect the houses are actually for storage, and the fences are breeding pens for shrimp and other shellfish. Fishermen commute to and from Ban Don Bay by long-tail boat . A maze of fish pens.